The Infinium Methylation EPIC array, which is the updated version of the HumanMethylation450 BeadChip by Illumina is an ideal cost-effective solution for epigenome-wide association studies (EWAS). The array gives single-base methylation information for over 850.000 CpGs throughout the human genome. It offers a unique combination of comprehensive, expert-selected coverage, high sample throughput, and affordable price. The process consists of several steps. We start the process with performing a first quality control step in which we measure the quantity and quality of the DNA provided by our customers. Only when the provided genomic DNA is of sufficient quality and quantity will we proceed with the next steps. In case the DNA provided to us is of insufficient quality and/or quantity, we will contact the customer and discuss how to proceed. 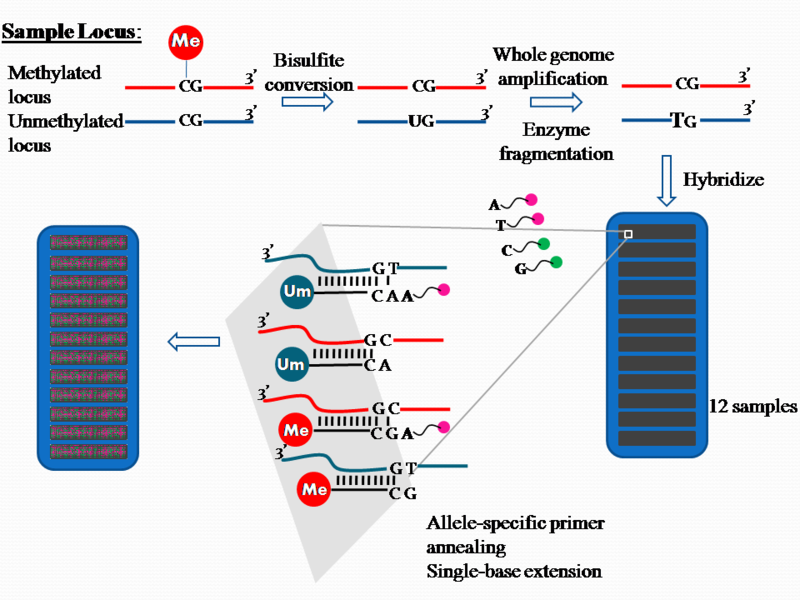 In a second step the genomic DNA samples are treated with bisulfite in order to convert unmethylated cytosines into uracil. After whole genome amplification uracil is transformed into thymine. The DNA is then enzymatically fragmented, purified from dNTPs, primers and enzymes, and applied to the array. Hybridization and single-base extension is performed followed by fluorescence staining and scanning of the chip.